Florence is a small and beautiful city full to the brim with Renaissance architecture and art, delicious cuisine and artisan boutiques. Finding the perfect place to stay in the city will ensure your memories of Florence linger for years. How could you forget the palazzos hugging the banks of the Arno and the elegant cafe lined piazzas where fountains have gurgled for centuries. The best place to stay in Florence for you will depend on your travel style and plans, preferences and budget. Do you want a coveted room with a view of the River Arno? Or a luxury hotel with a pool? Maybe you would prefer a romantic boutique style hotel in a converted palazzo. Or a villa in the hills overlooking the city. To help you decide, we created this guide to where to stay in Florence in 2019. While most of the hotels in Florence are within a few minutes walk of the Uffizi Gallery, Ponte Vecchio and Duomo, it is worth considering some of the neighbourhoods just out of the historical center. These areas offer a unique peek into Florentine life but also, often are much better value. We look for hotels and apartments with a unique feature or service. It could be a converted palace complete with restored frescoes, a rooftop bar with incredible views or an acclaimed restaurant on site. As we travel as a family often, we are always on the look out for accommodations that go out of their way to accommodate children. We look for separate beds and rooms (not sofa beds), availability of cribs and onsite facilities like a pool. Easy walking distance to attractions and transport is a factor too. And we always look for places that offer a decent breakfast to start the day. Here is a summary of the best accommodation in Florence by district. These areas are within walking distance of most of the city sights and attractions. Read the article for more details on the best places to stay in Florence and things to do in each neighbourhood. Note – this is not a guide for the ultra budget conscious. In our value / budget category we considered hotels at around €80 per night that delivered a ton of value. The Cathedral of Santa Maria del Fiore (Duomo) is one of the most iconic buildings in Florence and Italy. With its unique tiled exterior and magnificent dome, it is the centerpiece of the Renaissance city. No trip to Florence would be complete without at least walking past the Duomo but if it is your first visit it makes sense to stay close by. Staying at a hotel near the Duomo means you have the main attractions of the city at your doorstep. There are countless restaurants, rooftop bars and cafés to enjoy close by. And if you want to indulge in people watching or designer shopping, Via de’ Tornabuoni is temptingly near. This area is around a 10 minute walk to the main station- Santa Maria Novella. The hotel recently collaborated with Italian design house Pucci, to reimagine the Savoy with modern luxury with timeless elegance. It is the perfect place to stay for a luxury escape. The hotel has a unique mix of period setting and modern style. It is set in a restored Byzantine tower and Medieval Church so close to the Duomo that you can hear the bells toll throughout the day. So romantic! Hotel Spadai is a very popular boutique style hotel in the heart of Florence. With soundproofed rooms and a huge breakfast to start your day, it is one of our top recommended hotels in Florence. This hotel is ideal for those looking for a hotel in center of Florence without the usual price tag. The staff are helpful and if you book early you may find a room with a view over the city rooftops. There is a limited supply of short term rental apartments close to the Duomo available on Booking.com and AirBnB. Book early and you may just find the perfect vacation rental in the heart of Florence. Many people visit Florence just to go to the Uffizi Gallery, one of the world’s most celebrated art museums. The area around the Uffizi is also the best place to find accommodation and hotels with views of the Arno. Just imagine waking up to the view above. So romantic! It’s no wonder it inspired the classic novel and faithful film reproduction A Room With A View(which I believe should be mandatory viewing before a trip to Florence). In our opinion, this is the best area to stay in Florence whether it is your first or fifth time. Right in the heart of the historic centre of Florence near the Duomo, Ponte Vecchio and Palazzo Pitti there are countless restaurants and bars to enjoy as well as shopping opportunities and of course visiting the Uffizi Gallery. As you can imagine this is not the best place to find budget hotels in Florence. If you book six months in advance or earlier you may find an apartment in the area that offers excellent value plus views! Walking to the train station from this area takes around 15 minutes or it is a short taxi ride. La Terrazza, the Continentale’s rooftop bar is one of the best places for a sunset aperitivo in Florence thanks to the hotel’s incredible position on the Arno. Of course, the main attractions are just a short walk away. Art and culture can be tiring for little people. San Firenze Suites are close to the main attractions (and gelato stops) and provide a haven to relax in after a busy day of sightseeing and gallery hopping. You could also try Relais Uffizi – a hard to find budget family option. 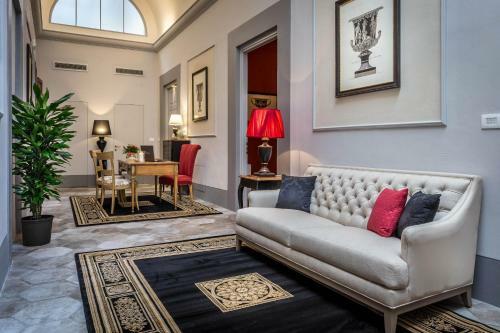 The Hotel del Corso is a great value hotel in the heart of Florence. Rooms are large for this class of hotel and the friendly staff ensure a memorable stay. 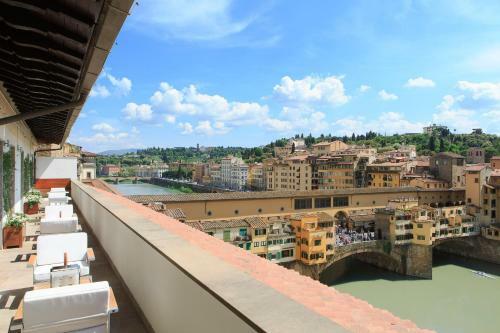 Apartments near the Uffizi offer great value when compared to hotels and if you book early you can find vacation rentals with incredible views of Florence. Start your accommodation search for vacation rentals around 6 months prior to your visit to uncover the best deals on Booking.com and AirBnB. Of course you must not miss the Uffizi Gallery itself. One of the world’s great museums and galleries, it is full to the brim with works by the Renaissance masters of Florence. Santa Maria Novella is the name of the beautiful Renaissance church pictured above as well as the main train station in Florence. We also included the neighborhood of San Lorenzo in this area close to the famous market of the same name. With easy access to the station, this area is a great place to stay for those who are staying a short while in Florence and are arriving and departing by train. You will find lots of things to do there too. We love the gourmet food court on level one of the indoor Mercato Centrale – it is a foodie paradise! As expected, there is art galore inside Santa Maria Novella by many Renaissance masters including Botticelli and Brunelleschi. One of the city’s landmark hotels, Grand Hotel Minerva overlooks pretty Santa Maria Novella piazza and is set in an historic property. Grand Hotel Minerva is the place to stay if you want a luxury stay in Florence with a resort feel. The rooftop pool area has stunning views of the city’s terracotta rooftops and the Duomo. This hotel has a wonderful reputation for looking after families. Established in 1903, the hotel interiors are decorated with frescos, historic photos, and paintings. You can also expect modern amenities including a smartphone with free local and international calls, together with mobile internet for use during your stay. Hotel Globus is within walking distance of Santa Maria Novella train station and the main attractions. This hotel is very popular thanks to its welcoming staff, thoughtful room design for families and buffet breakfast. Worth considering if you are on a tight budget for its fantastic location and larger room sizes in this price category. San Lorenzo Apartment – restored apartments with original frescoes sleeping up to 5 close to the market. The area near the train station and San Lorenzo market is busy and vibrant. Many tourists flock to the famous outdoor market for leather goods and souvenirs. Sadly, I think it is no longer the place for quality goods and more of a tourist trap. Persevere and venture up to the first floor of Mercato Centrale to visit the incredible food court. You will not be disappointed. Open 10am until midnight there are 100s of stalls featuring Italian and international cuisine and wine to choose from. Of course there are churches to visit and the Galleria dell’Accademia di Firenze where you can see Michelangelo’s original statue David close by. Trattoria Sostanza [Via della Porcellana 25 r] – has been cooking Tuscan classics since 1869 – must visit! La Dantesca [Via Panzani, 57/r] – Neapolitan style pizza or Florentine steak anyone? Santa Croce is close enough to the main attractions of Florence that you can walk everywhere, but you still get the feeling of a typical neighborhood. The Santa Croce basilica is my favorite church in Florence. It has a typical Florentine feel and incredible art work but it is also the final resting place of the city’s great citizens Galileo Galilei, Michelangelo Buonarroti and Macchiavelli. A statue of Dante Alighieri stands guard over the piazza where a Christmas market is held in December. It is also the venue for the Calcio Storico Fiorentino a traditional game like rugby played among four competing districts of Florence. We enjoyed aperitivo hour in the piazza watching the basilica turn various shades of blues, pinks and purples at dusk. The Santa Croce area is known for its restaurants and bars so you can happily spend an evening bar hopping and dining. Close by the Mercato di Sant’Ambrogio is a local market worth visiting for food shopping and a local vibe. An historic property, Relais Santa Croce is close to the main attractions of Florence by foot. Here you can experience a Florentine neighbourhood in elegant surrounds away from the main tourist traffic. You can also take a break from sightseeing in the rooftop pool with stunning views of Florence. 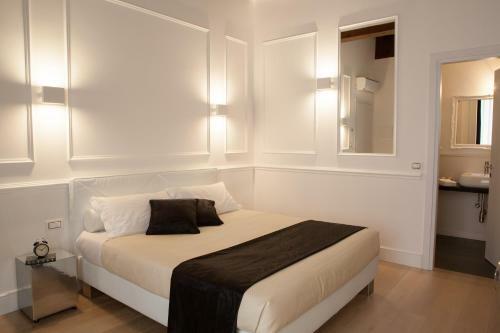 One of our favorite finds in Florence in the budget category, Hotel La Casa di Morfeo offers a comfortable stay at a very reasonable price with lots of added extras. Reviews consistently mention the friendliness of the staff at this hotel close to Santa Croce. If you want to experience Florentine living, then check the listings on Booking.com and AirBnB for Santa Croce. That’s exactly what we will be doing when we next visit Florence. Our favorite things to do in Santa Croce is simply wander and stop at cafes and absorb the beauty of the basilica. Oltrano literally means “other side of the Arno”. Many visitors to Florence only venture a few steps into this district as they cross the Ponte Vecchio, but they are missing out. The best known attractions in Oltrano are the magnificent Pitti Palace, former home of the Medici, and elegant Boboli Gardens. Stuffed full to bursting point with yet more art and treasures, Palazzo Pitti has over 500 Renaissance paintings in its Palatine Gallery alone. Visit the Boboli Gardens and discover the most famous example of Italian style landscaping developed over four centuries. Strolling the streets of Oltrano uncovers artisan leather and stationery workshops, cool bars and contemporary restaurants. This is definitely the spot to stay if you want to explore Florence with the locals. After you have finished breakfast gazing at the Ponte Vecchio, walk the short distance over the bridge to the main sights of Florence. Even if you are not staying at the hotel, the Picteau Lounge bar has cocktails with a view. Palazzo Ridolfi is set in an historic building close the Ponte Vecchio. A recent restoration has enhanced the existing period features with modern comforts. Start your day with breakfast on the rooftop terrace overlooking the iconic sights of Florence. Then take your kids for a wander around the magnificent Boboli Gardens close by – one of the few green spaces in central Florence. Finding an apartment or vacation rental in these areas is challenging. There is limited supply so remember to search and book early on Booking.com and AirBnB. Marina di Santospirito [Via Maffia, 1/C] – the freshest seafood in town. To the east of the main Oltrano district, San Niccolo and the area around Piazzale Michelangelo is a fun neighbourhood with bars, restaurants and boutiques to discover. Most people come to this area for the sweeping views of Florence from Piazzale Michelangelo (see above). It’s a steep walk up the hill if you are on foot but I am sure you’ll agree it is well rewarded. Last time we were there, they had a gelato festival on in the piazza – how lucky was that?! The views from Villa La Vedetta rival those of nearby Piazzale Michelangelo. With a well regarded on site restaurant on site and outdoor pool area, it is the perfect hotel to enjoy if you want to mix your Florence culture fix with relaxation. This lovely friendly hotel is popular for good reason. Hotel David provides all those little touches that make a stay memorable at a very reasonable price. Want some more help planning your trip to Florence and Italy? We love helping visitors to Italy plan their ultimate trip. Here are some guides and information we hope you find useful. You might also like to join our FREE Italy trip planning Facebook group where members share their knowledge and ideas to help you plan your trip to Italy.